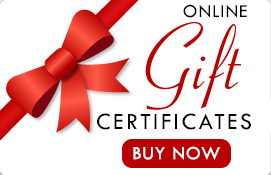 Print, email or text a personalized gift certificate in minutes. We serve clients at 2929 Summit Street, Suite 103 in Oakland, CA OR in the comfort of their own homes in Alameda, Berkeley, Emeryville, Oakland, and Piedmont. Please call beforehand if you'd like to purchase a gift certificate for a friend or family member who lives in another East Bay Area city. Thank you! All gift certificates are valid for one (1) year after issue date. No refunds.